“So sad,” to quote our current president (not a president known, so far at least, for his eloquence). But I’m not sliding over into political commentary. I use to that pithy quote in reference to the fleeting glory of Rose d’Ipsahan. A little background: Rose d’Ipsahan was given to me many years ago by a local herbalist under the name of Rose de Rescht, which it soon became evident it was not. Descriptions of Rose de Rescht tell how it blossoms repeatedly through the season; not my rose. I finally honed down my rose’s identity from among the choices suggested by a number of rose experts based on photos and descriptions I had sent them. 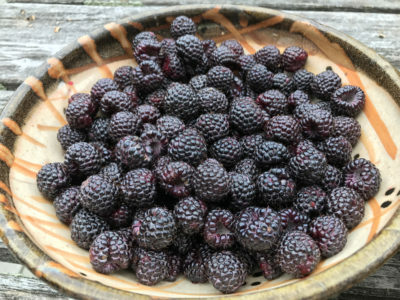 It’s a bumper year for blackcaps (also know as black raspberries or, botanically, Rubus occidentalis), at least here on the farmden. Up to last year, we harvested wild blackcaps from plants that pop up at the edges of woods. The current bountiful harvest is from blackcaps that I planted a couple of years ago. Last year’s harvest was unimpressive because the plants were still settling into their new home. I come to appreciate death as a sign of life — in flower longevity. 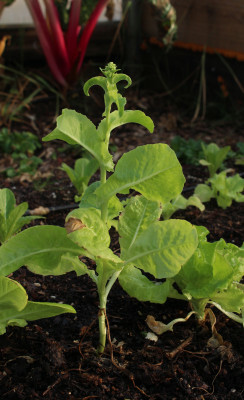 Not so happy with aging in the greenhouse, though; new seedings will, with spring-like weather in there, soon offer fresh, young lettuce, arugula, and other salad greenery. I’ve said it before and I’ll say it again: I’m not a big fan of roses. But I can’t help myself. 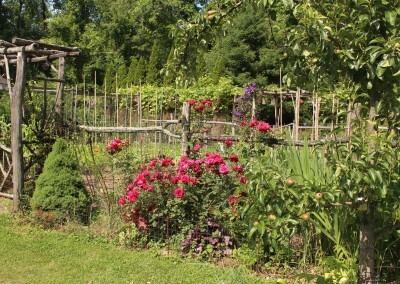 The garden is awash in golden yellow, crimson red, soft pink, apricot pink, and plain old pink blossoms. Almost all of this is thanks to David Austin, breeder of roses. My father was a big fan of roses, so I was exposed to them at an early age. Pre-dating Mr. Austin’s creations, my father’s roses were the ever popular — except with me — hybrid tea roses which everyone — except me — liked and likes for their pointy, formal blossoms, their bold colors, and their repeat bloom. Nobody mentions their gawky stature, general lack of strong or interesting fragrance, and attraction to pests.